Thurston County makes on-site inspections at specific points during the construction of your home and keeps records on file for future reference. Beyond the immediate role of ensuring safe construction, these inspection records provide verification of no longer visible building elements located within a building or structure. Lending institutions, appraisers, lawyers and others can then rely upon these files in determining the value of a building. To request an inspection call our Building Inspection Request Line. Before requesting an inspection, all property corners must be clearly marked. To speak directly with a building inspector, please call between 7 a.m. and 8:00 a.m. Monday through Thursday. We will start scheduling inspections on Fridays beginning March 3, 2017. 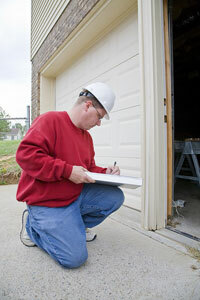 To see a checklist for the final residential building inspection, click here. Sedimentation and Erosion Control: To be made after erosion control is installed (silt fence, stray wattle, construction entrance, etc.) and prior to any other earth disturbing activity. THIS INSPECTION IS STILL REQUIRED EVEN IF UTILIZING ONLY NATURAL VEGETATION FOR EROSION CONTROL. If you attempt to schedule and are not allowed, most likely the inspection took place during the initial review and has already been closed. Footing and Setback Inspections: Excavation for footings should be complete, and all required reinforcing steel should be in place. Any required forms and all bedding materials for an all-weather wood foundation system should be in place. Foundation Wall Inspection: Request this inspection after all forms and required reinforcement, foundation vents and access openings are properly installed, but before concrete placement. Concrete Slab Inspection: Request this inspection after all in-slab building service equipment, conduit, piping accessories and other ancillary equipment are in place, but before concrete placement. Please note: this inspection is required only if any of the above in- or under- slab items were installed. Shear Wall Nailing Inspection: Request this inspection after all framing members have been installed in the area where shear wall panels or lateral restraint panels have been specified by a private engineer or by Thurston County. Required hold-downs and strapping must be in place and all nailing completed. No covering (installing siding, insulation, wallboard, etc.) may begin until this inspection is done. Electrical Inspection: All electrical wiring and hardware must be approved for cover and service by the Washington State Department of Labor and Industries Electrical Inspection Division. You should request this inspection by calling (360) 902-5242. Your Electrical Inspection must be approved before requesting a Framing Inspection. Construction BMP Inspection (within the Urban Growth Areas): To be made prior to Framing Mechanical and Plumbing inspections. This inspection is required to ensure compliance with Sediment and Control Best Management Practices (BMPs) during construction. Schedule this inspection only after you have reviewed your site and made any repairs/revisions (silt fences, wattles, 25-ft veg. strip, construction entrance, etc.). Plumbing Rough-In Inspection: Request this inspection after all drain, waste, vent and water supply piping is installed and during water or air pressure testing. This inspection may be approved before or at the same time as the Framing Inspection. Mechanical Rough-In Inspection: Request this inspection after all mechanical equipment and ducting (including bath fans, range hood – if ducted, gas piping and wood stove chimney(s) are installed and during air pressure testing of the gas pipes. This inspection may be approved before or at the same time as the Framing Inspection. Propane Tank Inspection: Request this inspection if you have installed a propane tank. This inspection may be approved during the Mechanical Rough-In Inspection. Framing Inspection: Request this inspection after the roof, all framing, fire blocking, windows, chimneys, exterior siding and bracing are in place; all plumbing, mechanical and electrical are approved for cover; and energy code caulking and sealing are done. Insulation Inspection: Request this inspection after all concealed areas (walls, cathedral ceilings, etc.) are insulated, but before covering. Accessible attics and under-floor areas will be inspected during the Final Inspection. Gypsum Board Inspection: Request this inspection after all interior and exterior gypsum board is in place, but before plastering is done or gypsum board joints and fasteners are taped and finished. Final Electrical Inspection: After all electrical trim and appliances are installed, call the Washington State Department of Labor and Industries at (360)902-5242 for a Final Electrical. DEV REV Final Inspection: To be made prior to Final building inspection and after drainage system and soil amendments are completed. Please note that this inspection shall be completed within three (3) days of the scheduled inspection date. Final Access Inspection: When your driveway is installed, call Thurston County Development Review/Public Works at (360) 867-2050 for a final inspection. Final Inspection: Request this inspection after the grading is done, the septic as-built drawing is approved, and the home is ready for occupancy. The address that is clearly legible from the road should be posted. When all required inspections have been completed and approved, you will receive a Certificate of Final Inspection. Your new home is now ready for occupancy. Ask the building inspector approving the final inspection of your home to give you the County copy of your approved Building Plans. Please keep these plans, your Certificate of Final Inspection, your permit card and other permit and construction documents in a safe place for future reference. If you decide to remodel or build an addition onto your home, these documents will serve as a record of what was constructed on your site and as a useful reference for your designer or builder. CONGRATULATIONS!